Allium ‘Millenium’ piqued my interest back in May when we received about 20 plants for our annual TBG plant sale. As I have always been intrigued with alliums, I immediately set aside a few plants to be planted later in the southeast end of the entry garden. Since then I have been observing the plants throughout the season and have been very pleased with their performance to date. The narrow grass-shaped foliage is a clean rich green and rises up from the base of this hardy perennial with an interesting and whimsical twist. 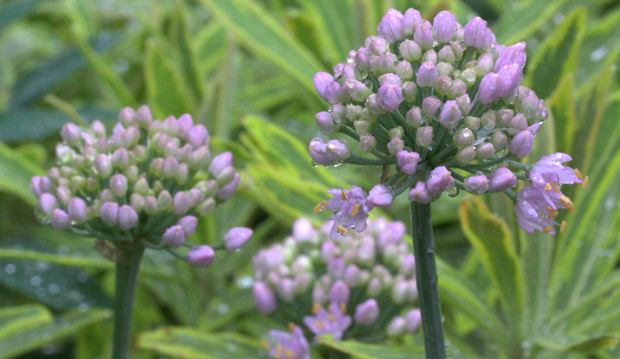 By mid-July, multiple flowering stems (scapes) began to emerge through the foliage eventually bursting into spheres (umbels) of purple blossoms 15-20” tall. 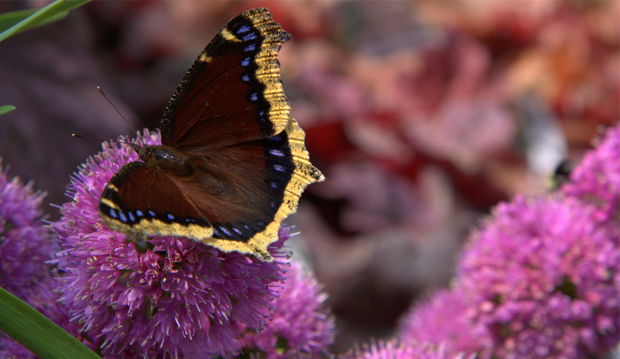 From the very first day that the individual flowers began to open, bees, butterflies, moths and other pollinators have battled for their position to feed on the blossom clusters. Yes, this is defiantly another bee magnet plant that we will be adding to the pollinator garden next year. The plants bloomed for several weeks and while some still have fresh new buds just beginning to open, I feel the peak of bloom for most of the plants is about to pass. “Oh no!” What will all the pollinators feed on? No worries, in the same bed yet another interesting ornamental onion, Allium senescens ‘Blue Eddy’ is only just beginning to send up flower spikes. 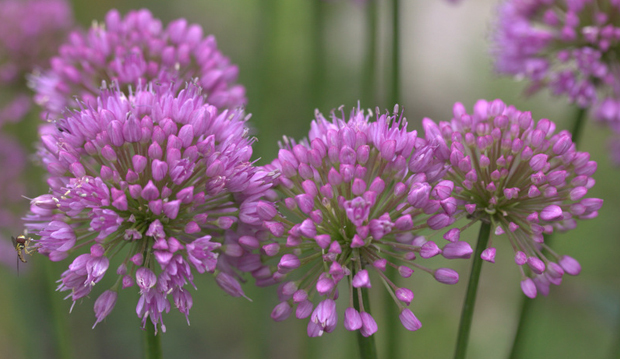 This new allium is a selection made from Allium senescens ‘Glaucum’, a wonderful late summer blooming perennial I have grown and admired in my home garden for many, many years. I have always appreciated the colour and texture the grey-blue foliage of this perennial adds to the garden throughout multiple seasons. In late summer, clusters of lilac to soft pink blossoms appear on 12” stems. Both of the alliums discussed above are best planted in full sun to part shade and have both shown some drought tolerance. They are also deer and rabbit resistant. 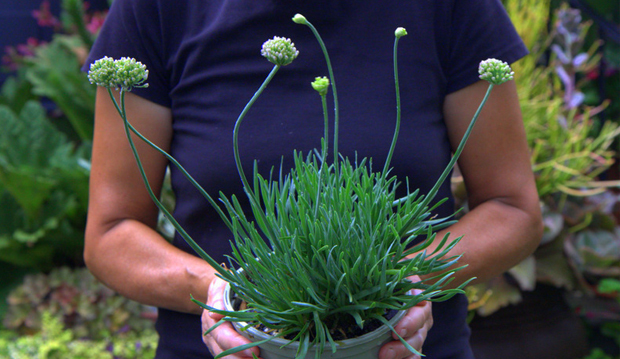 Allium senescens ‘Blue Eddy’ will be one of the many offerings at the Plant Dash on September 25. If you happened to miss out on one or both of these plants at this year’s plant sale, you have another limited opportunity to grab and add these to your own personal collection. Both selections will be part of the Plant Dash at the last of the Garden Open evenings on September 25. The Garden Open series has been specifically designed to raise awareness and support for the botanical collections and the ongoing maintenance of the TBG gardens. I hope you will be able to join us for what promises to be an exciting evening. On sales over $10, Members enjoy a 10% savings off regular priced items. What’s In Bloom: Hello Beautiful! Buy your tickets early and save! Growing potatoes in containers is kids’ play!